I’m not typically a fan of thrillers, mostly because I don’t need an excuse to be anxious about more things, but I scooped up Sharp Objects to prepare me for watching HBO’s television adaptation. I did the same before I watched Gone Girl (also by author Gillian Flynn) and it made watching the movie much less nerve wracking because I knew exactly what to expect. I picked up Sharp Objects for the same experience and while it was definitely a page turner that I read incredibly quickly, the entire time I was reading, I just wanted the whole story to be over. I probably wouldn’t have pushed through the novel if I wasn’t planning on watching the TV series, but I am… so I did. Sharp Objects is a thriller mystery that revolves around a Chicago journalist returning to her hometown after two similar murders are committed (the victims are young girls). The journalist has to return to her toxic home that she had distanced herself away from in adulthood and finds herself reverting to her previous mindset and habits along the way, whilst trying to gather details about the unsolved murder cases. While I loved the details put into the main character and her depth, I would’ve preferred reading about her within another story that didn’t completely creep me out the entire time I was reading it. Publication Date: 26 September 2006 by Broadway Books. Format: Paperback. This entry was posted in fiction, mental health, mystery, Review, thriller and tagged book review, books, broadway books, crown publishing, fiction, gillian flynn, gone girl, hbo, mystery, random house, sharp objects, thriller on October 13, 2018 by Bri with a book blog. Mari Andrew is best known for her adorable, insightful Instagram illustrations. Most of Andrew’s illustrations on Instagram and within her debut book, Am I There Yet?, portray finding yourself and/or creating yourself as the person you want to be, and all of the mishaps and misfortunes that happen along the way. While I love peeping at Andrew’s illustrations on Instagram and gaining bite size perspective, her book is situated into different chapters (such as heart break) and Andrew typically prefaces each chapter by contextualizing different events that have influenced her perspective on the theme. The contexts were helpful because they illuminated how Andrew experienced a huge perspective shift in her 20s that changed how she approached subsequent problems and her life. If you enjoy Andrew’s beautiful watercolor depictions on Instagram, you’ll probably enjoy flipping through this collection of illustrations and their back stories. I found it to be a very quick weekend read that left my heart feeling cozy. Publication Date: 27 March 2018 by Clarkson Potter Publishers. Format: Hardcover. This entry was posted in advice, essays, memoir, nonfiction, Review and tagged advice, am i there yet?, art, clarkson potter publishers, crown publishing, illustrations, illustrator, instagram, mari andrew, watercolor on September 28, 2018 by Bri with a book blog. This past weekend, I flew from New York to Dallas to visit my family for my cousin’s wedding. I love going home to visit family, but I do not love the fact that my flights home, without fail, always end up delayed. When I’m not traveling anywhere but home, I don’t mind getting delayed because it means I get more listening and crafting time as I’ll usually listen to a podcast or audiobook while knitting. However, when I’m going home to see family, every hour taken away from me stings. All of this is a lengthy way of saying, I got delayed while traveling this weekend and subsequently was able to listen to all of Dad is Fat by Jim Gaffigan while knitting a baby blanket for my soon-to-be-born niece in one sitting. The fact that I was knitting a project for the impending arrival of a new edition to my family while listening to this audiobook was perfect. While I assumed that some of the essays within this memoir would cover parenting based on the title, I didn’t realize that literally every essay contained within Dad is Fat would cover the author’s relationship with and perspective on children. The author is stand-up comedian and actor Jim Gaffigan, who, at the time of the memoir’s publication (2013), is a proud father of five. I had no prior knowledge of Gaffigan’s previous endeavors, which include comedy albums and specials (two are currently on Netflix) and television appearances, but the lack of Gaffigan background didn’t prevent me from enjoying any of his stories. Usually, I only read memoirs by famous people if I’m already a fan of them or if they’re not famous and their story intrigues me, but I received this recommendation from a friend who works with children frequently and decided to trust her on it. Thank goodness I did! I definitely would have enjoyed his memoir even more if I had been a parent, but since I interact with children frequently, I found most of the essays and jokes to be extremely on-point and humorous. That said, if you find children annoying (Jim does too!) and can’t bear to stand to hear about them (Jim finds humor in their annoyingness! ), this book is definitely not for you. Overall, I enjoyed this book and think it’s probably better to be heard in audiobook format since the author/narrator is a comedian and is clearly skilled in delivery and comedic timing. The essays are fairly short and I feel like I might have gotten annoyed by that if I was physically reading the book, but in audiobook format, all of the essays flow together seamlessly. There will be a TV show based on his family life coming to TV Land this summer… which funnily enough I saw a promo for while sitting in a cab on my way back to my apartment from the airport. You can watch some promos of the show here. Publication Date: 7 May 2013 by Crown Publishing Group. Format: Digital Audiobook from Random House Audio. 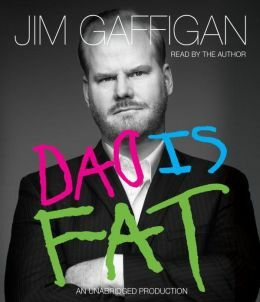 This entry was posted in audiobook, essays, humor, memoir, nonfiction, parenting, Review and tagged audiobook, book, book review, comedian, crown publishing, funny, humor, jim gaffigan, memoir, nonfiction, parenting, random house audio on April 29, 2015 by Bri with a book blog.